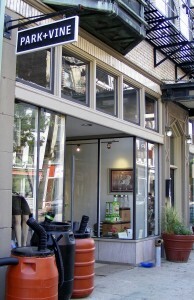 Park+Vine, Cincinnati's "green general store," is now located at 1202 Main St. in Over-the-Rhine. The chill in the air didn’t keep the children of the “Woodstock Nation” from the Earth Day celebration in April at Sawyer Point. Hippies, young and old, but mostly young, danced and played Frisbee on the lawn as folk bands played. Their floppy hats and tattered jeans suggested that they might be mellow enough to forget to feed their fish. This generation, though, is all but apathetic. They are environmentally conscious, not afraid to show it, and have created a demand for eco-friendly products and clothing that retailers in Cincinnati are beginning to fill. Years ago, green products were made for fringe groups, tree huggers and anti-fur radicals. Among green merchandise offerings were rough hemp pillowcases, which are ideal if an overnight facial exfoliation is in order. Today, though, green products have become practical and sophisticated, something non-liberals can embrace without changing their religion. For example, Park+Vine, Cincinnati’s “first green general store,” has held its own in the stylish Gateway Quarter in Over-the-Rhine since it opened last June. CityBeat called Park+Vine “a swank hang out for sustainable living enthusiasts.” Graphic-print natural fiber rugs cover the shiny bamboo floors. Brightly colored pillows made from reclaimed fabrics look as if they’d come from West Elm or Pottery Barn. Electronic music plays in the background and sleek art hangs from exposed brick walls of the restored Italianate building on Vine Street. The store caters to professionals and complements its retail neighbors that sell contemporary furniture, home décor items and eclectic gifts. 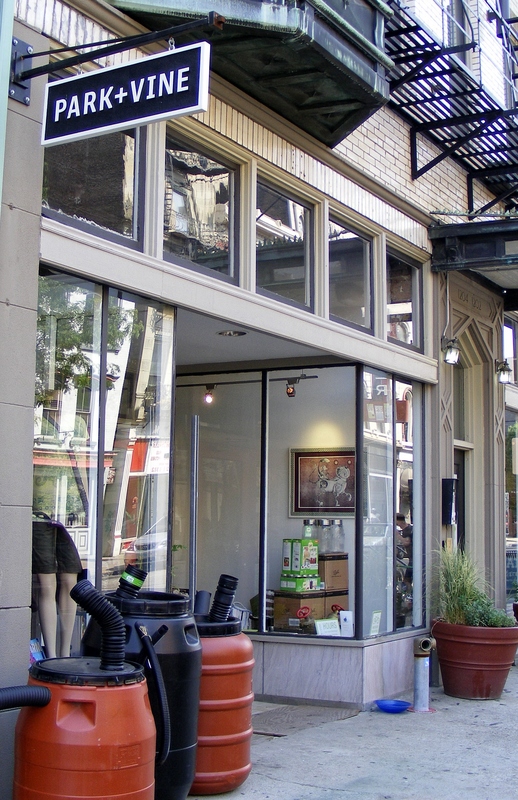 “A lot of our regular customers shop at Mica and City Roots next door,” says Dan Korman, owner. Vine Street has always been a good place to take the pulse of the city. Art galleries, theaters and Music Hall firmly anchor the growing neighborhood that has been bolstered by converted lofts and mod apartments. Jean Robert de Cavel’s Lavomatic Café, a hip-yet-casual restaurant, has fed and watered the theater crowd since it opened its doors in February. Park+Vine’s clients are not the average deadheads. According to a study by Deloitte, a business advisory firm, 17 percent of people plan on buying green this year. Korman sees these statistics play out in his customers. “A lot of the people coming in here are young and are generally concerned for the future of their family.” Quality control is a very real concern for the mainstream public, a natural outcome of the scare this past year with lead-based paint in toys made in China. “My customers want no connection to goods made in China,” he says. The alternative, buying American, is not as easy as it may seem. “It’s really hard to find clothing made in the U.S., eco-friendly or not,” he adds. He says that he tries to find as many local manufacturers within the “green circle,” jargon that means buying within a 100-mile radius. Purchasing within the green circle “limits the consumption of petrol chemicals,” according to Jon Burkhardt, who works at Park+Vine. For example, Cincinnati native Michael Palmer created the fashion line “Nati Evolvement” for American Apparel, which Korman sells at his store. “Look At Me,” “Wire And Twine” and “Alternative Motive” also print t-shirts locally using base shirts from American Apparel, which are made in the U.S. Other locally made products sold at Park+Vine include Union’s Bloom, a Northern Kentucky company that makes bags, and “Culpepper’s Daughter,” which produces herbal personal care products. “Linda’s Luxuries” manufactures bar soaps and is also sold at Findlay Market. Aside from the obvious benefit of reducing harm to the environment, many of the goods sold at Park+Vine come wrapped as a bundle of benevolence. For example, a set of lime-green coasters tied in rattan carry a tag that describes how the vendor, the St. Vincent de Paul Society of Lane County, Oregon, helps with emergency services, housing and job training for those in need. Eira, a 21-year-old geography student at the University of Cincinnati, buys makeup and cleaning products at Park+Vine. One of her favorites, she says, is Just Soap. Its churning process is powered by a bicycle pedal, not energy generated from fossil fuels.